Congratulations to the Benjamin’s on their beautiful 33′ dome! Our facebook community has voted, and this is the picture they liked the most this month. 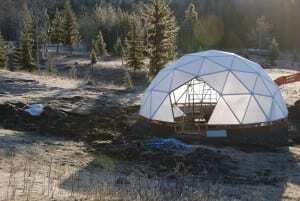 Hailing from Cariboo, British Columbia, Canada, Darcy and Simone love their growing dome. “It looks very cool out there, almost like a UFO landed in our yard” remarked Simone. Way to go guys! and keep on growing! Would love to see your growing dome. We are in Big Creek, B.C. Would you be willing to show me your dome, and if so, where are you located?